The EUROTOX Molecular Toxicology Specialty Section is organising the Inaugural Course on Molecular Toxicology taking place June 26-29, 2019 at Ege University, Izmir (Turkey). EUROTOX and the Cellular and Molecular Mechanisms of Toxicity Gordon Research Conference (GRC CMMT) are pleased to announce up to 4 fellowships for students, postdocs or early career scientists (<10 years post PhD) currently working or studying in Europe to attend and present at the 2019 GRC CMMT to be held from 11-16th August 2019 at Proctor Academy, New Hampshire, USA. 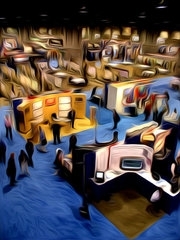 Full registration/accommodation costs and EU1100 towards travel will be provided. To apply, please submit an abstract via the conference website by May 10th 2019 and notify the chair john.richburg@austin.utexas.edu of your wish to be considered. EUROTOX Executive Committee Members were at the recent SOT meeting to promote EUROTOX and the upcoming 2019 Helsinki Congress. Pictured Left to right (top row) Hilmi Orhan (Member), Kai Savolainen (2019 LOC), Felix Carvalho (President-Elect), Martin Wilks (General-Secretary) and Emanuela Corsini (Member). 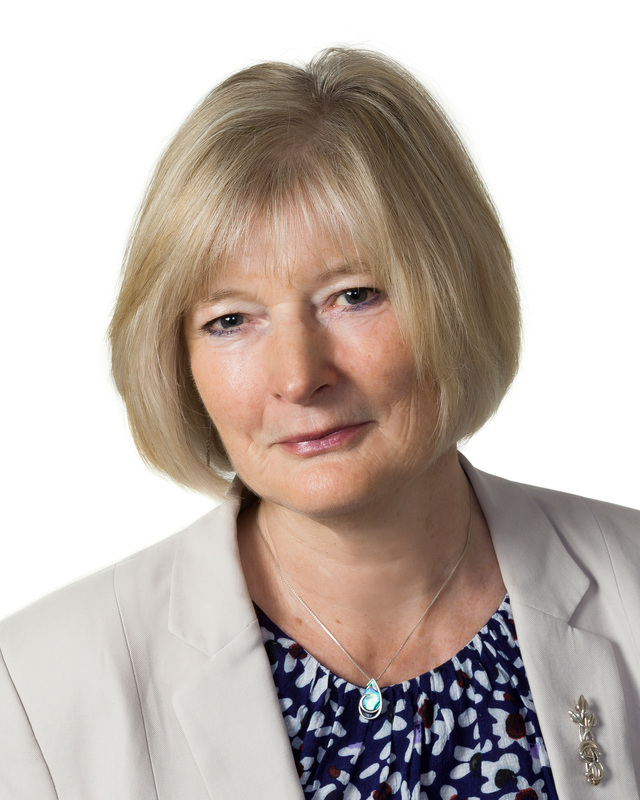 Front row: Heather Wallace (President). 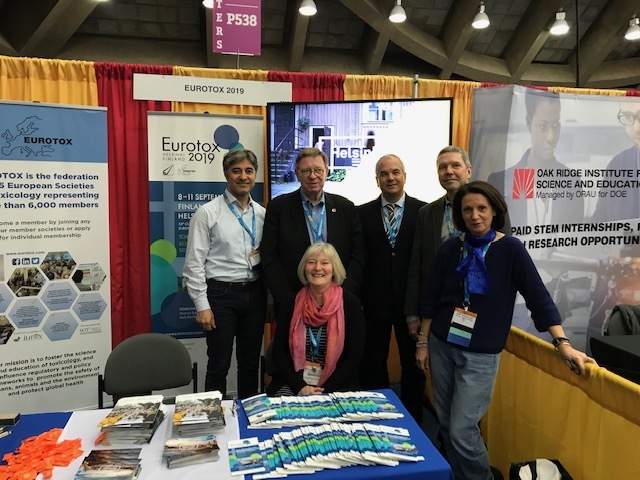 "We appreciate all the EUROTOX members at SOT who volunteered to help us man the booth, and made this a successful experience", said Heather Wallace. "The EC has been working hard to increase the visibility of EUROTOX at specific events, but we can't do it without our members, so we are happy when they are eager to help", she concluded. In addition, to their PR duties, members were actively involved in program activities. For instance, Felix Carvalho chaired the SOT-EUROTOX debate as speakers Martin van den Berg (EUROTOX) and Paul Foster (SOT) tackled the topic of "Classification of Substances as Endocrine Disruptors Has a Public Health Benefit", while Heather Wallace introduced the Bo Holmstedt Memorial Lecture, delivered by Nigel Gooderham, On Wednesday morning, EC members meet with SOT leadership to continue to discuss on-going SOT-EUROTOX collaboration projects. As we wrap up the 2018 EUROTOX congress, we want to highlight the various awards presented in Brussels, and congratulate the respective recipients for their scientific contributions and professional excellence in toxicology. EUROTOX honours annually a distinguished European toxicologist with the Merit Award. This year's Merit Award recipient is Prof. Corrado L. Galli. 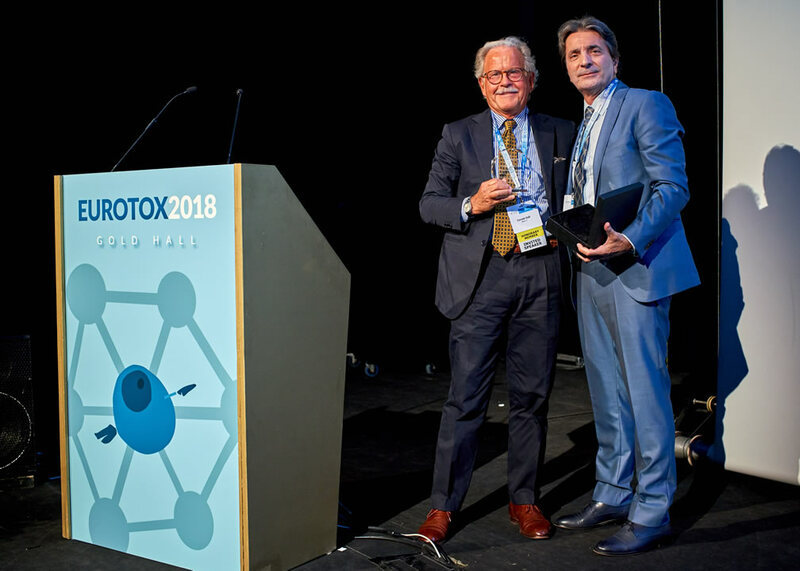 Prof. Mumtaz Iscan, EUROTOX President (2016-2018) presents the 2018 EUROTOX Merit Award to Prof. Corrado L. Galli at the opening ceremony of the Brussels congress held September 2, 2018. The Bo Holmstedt Memorial Foundation (BHMF) Lecture Award is presented every year during the EUROTOX congress to recognise scientists who have made outstanding research contributions to the science of drug or chemical toxicology. This year's BHMF award recipient is Prof. Nigel J Gooderham. 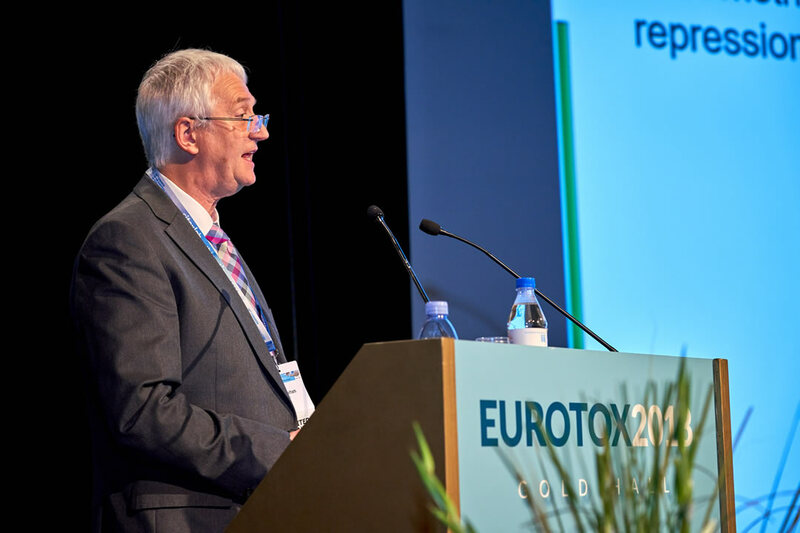 Prof. Nigel Gooderham, recipient of the 2018 Bo Holmstedt Lecture Award, delivers his presentation at the EUROTOX Brussels congress held September 4, 2018. Early career toxicologists are encouraged by the annual Early Career Awards for best poster presentation in two distinct categories. The EUROTOX Gerhard-Zbinden award for drug-oriented toxicological research was presented to Dr. Timothy Allen, University of Cambridge (UK) for this work on "Computational approaches for predicting Molecular Initiating Events", while the ECETOC Christa Hennes Award for toxicological research into mechanisms and risk assessment was presented to Dr. Wael Naboulsi, Signatope GmbH (Germany) for his work on "A classical and an immunoaffinity-proteomic study to identify and validate drug-induced kidney injury biomarker in canine". 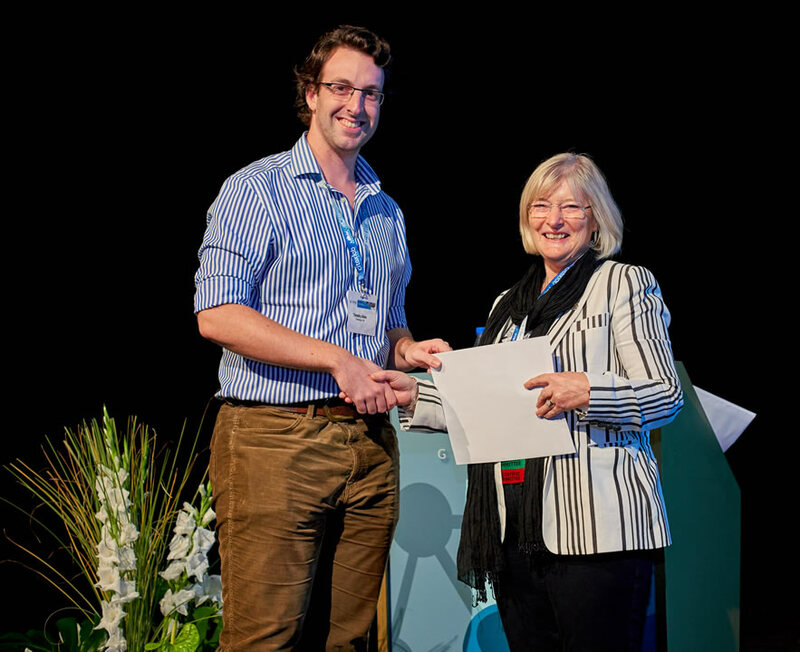 Prof. Heather Wallace, EUROTOX President (2018-2020) presents the EUROTOX Gerhard-Zbinden (G-Z) Early Career Award for drug-oriented toxicological research to Dr. Timothy Allen during the closing ceremony of the EUROTOX Brussels congress held September 5, 2018. 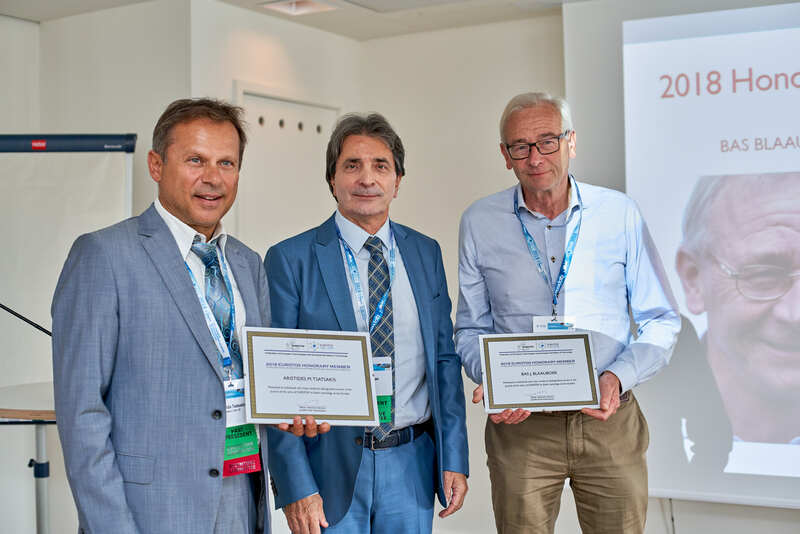 Presented at the 2018 EUROTOX Business Council Meeting to recognise individuals who have rendered distinguished service to foster toxicology across Europe, the 2018 EUROTOX Honorary Member recognition was presented to Prof. Bas J. Blaauboer (The Netherlands) and Prof. Aristidis Tsatsakis (Greece). 2018 EUROTOX Honorary Member recognition presentation during the 2018 Business Council meeting held in Brussels, September 4, 2018. Pictured left to right: Aristidis Tsatsakis, Mumtaz Iscan, EUROTOX President (2016-2018) and Bas J. Blaauboer. EUROTOX is pleased to renew the fellowship program for 2019 to support fellowships to attend comprehensive training courses in toxicology (ERT courses), and for cross-border exchange of teachers on such courses. Participants are adviced to send in their applications within the given deadlines since 2019 will be the last year the Fellowship Program will run. Full details regarding eligibility and application process can be found here (for course attendees) and here (for teachers). Following the formal adoption by the Executive Committee during the Seville EUROTOX 2016 Congress in September 2016, the "European Registered Toxicologist (ERT) Guidelines for Registration 2016" are now in force. The text of the Guidelines, together with annexes, can be found on this website under the heading ERT. These Guidelines replace the 2012 version. The changes compared to the former version are a more precise description of the procedures and the requirements for registration and re-registration. 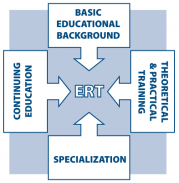 The addition of annex 1, which describes the foreseen learning outcomes of the core themes in toxicology, will be instrumental in determining the required level of theoretical knowledge for being a ERT. Annex 2 describes a procedure for the recognition of teaching activities (courses etc.) and provides guidance for course providers who wish to obtain recognition by EUROTOX for courses as part of the comprehensive theoretical training for registration of toxicologists or continuing professional development (CPD) for the purpose of maintaining ERT registration.